Recently I have taken on three private students, including my 16 year old son who I have decided is responsible to handle the information and use it with discretion. One of the student I have known for several years. Yesterday was the first time I struck both he and my son hard enough to let’s say…stun them. They both took it well and recovered quickly. Both strikes were to targets that had probably never been struck before. This causes a little mental freak out because the body is not familiar with acute pain in that area of the body. Afterwards we were sitting around talking and my buddy stated that the fear of being injured had kept him from training for several years. Like mine, his wife is a stay at home Mom and he is the sole bread winner. This was an interesting comment coming from him because his firearms training, both pistol and long guns exceeds the vast majority of others. He works security for a Department of Energy facility and they are well funded and their firearms training is frequent and exceptional. But he knew as a CCW holder, even with his professional firearms training, his “training” was lacking. Level 1- Can take the pistol to the range and load, unload, and shoot it at a target but is not proficient or comfortable handling the gun around other people. In my experience, this is the level that many gun owners are at. Even though they are not a danger to themselves, once they have the gun out around other people they continuously laser/flag them. Much of what they know, or think they know they have figured out on their own, from friends or family, or even worse, on the internet. If you ask them where they got their information, they will usually say something about a friend or who was in the military or law enforcement. Level 2- This is the level that most veterans and law enforcement are at if they have no personal interest in firearms, only professional. This is where cops who choose to not carry off duty are. They have had professional and standardized training that was created to teach large numbers of people to be “competent” with firearms. Level 3- This level is where most reading this article probably are. They may or may not have had military or law enforcement training. They might have sought out training from someone who had a background training law enforcement or military, wanting their training to have some sort of a pedigree. 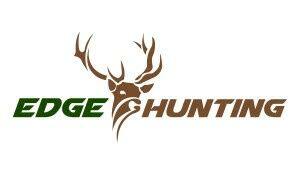 They know the basics inside and out and can move around others comfortably with their gun and not laser/flag people. Level 4- Those at this level may have attended some actual courses. They have probably spent quite a bit of money on gear and training, in that order. Carrying a pistol is a predominant part of their lifestyle. They might be engaging in competition. They might even own a shot timer and talk about “splits”. Level 5- This is the level where the shooter wakes up and realizes that all his square range training has little to do with actually being involved in a real shooting. Many people know this, but few act on it. If they do, they will begin doing force on force training. They will know that a blue gun and airsoft are worth more than a case of ammo. They have hopefully enlisted some like-minded friends. What do the first four levels have in common? None of them involved interpersonal fear or conflict. Nobody is yelling at you, much less having physical contact with you. If you relate it to basketball, it would be like shooting hoops and making baskets from varying distances, but with nobody else on the court or pressuring you. The more time you spend in Level 5 the more you realize that at the distances you are working from that automatically going to the pistol is not always possible or the best option. You realize that you need open hand skills. 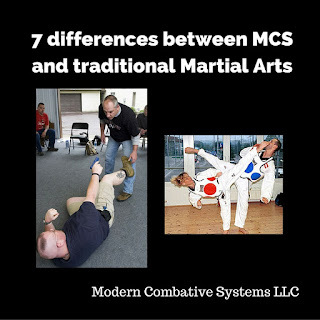 MCS Level 1- The first thing you should know is that this is the only level we have in the Modern Combative System. 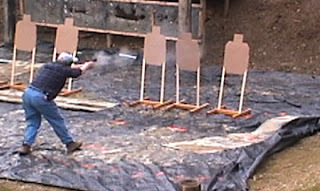 Full integration and continuity of open hand combatives, edged weapons, impact weapons, and pistol within seven yards. There is a heavy emphasis on Combative Anatomy and interpersonal communications. The underlying mindset is that if Awareness, or Avoidance has failed or eluded you, and you must use force, the person you have been forced to use force against should feel like someone has put a Wal Mart bag over their face and they are being attacked by bees. You must be decisive and totally mentally and physically shut them down using the least amount of force that allows you to escape the situation. It is impossible to accomplish this without some bumps and bruises along the way. Denial and failure to train for the realities of interpersonal conflict will not exempt you from them. To my private students and those who have trained with MCS over the years, I will quote my late friend Paul Castle “those who know, know”.